[AUTO](RC):[Soul Blast (2) & [Rest] this unit] When a «Kagerō» normal unit in the same column as this unit attacks, you may pay the cost. If you do, that unit gets [Critical]+1 until end of that battle. 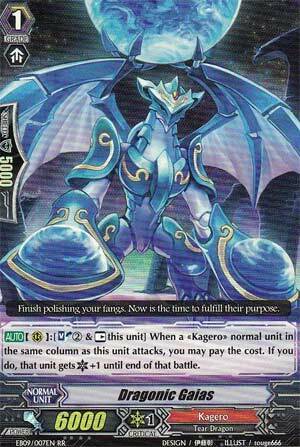 ...this card is just odd in a bad way. If you're going to be playing a Grade 1 with 6,000 power, then 9 times out of 10, it's only going to be the Sentinels while the other Grade 1's are 7,000 with good effects or the regular 8,000 power units, but with this, I've always had a bad vibe with 6,000 power units and boosting with them...especially when if you use said card's effect to make it obsolete as far as boosting goes. In short, when one of your frontlines call an attack in the same column as this piece of dung, then you can Soul Blast 2 and Rest this unit to give it a bonus Critical...that's it?! The fact that this card's cost in Kagero is just way too high (seeing how they very rarely gather Soul to begin with) means that you'll only be able to really pull off this effect once or twice at best...so after failing to using this, afterwards, it's only a 6,000 vanilla card...SO BAD!!! Just get your Nouvelleroman Dragons and you're pretty much golden. Next Time: Because he Kaioken get it done. This one's easy. When the unit in front of it attacks, you Soulblast 2 and rest Gaias to give the unit +1 critical until the end of the battle. Not much to say. Obviously it's meant to go behind the Vanguard since that's the unit the least likely to get blocked in the middle of the game. Only problem is that by resting this thing, you miss out on its boost. So the attack is easily blockable, making it a costly inverted +0 for you. Take into account its low power and...yeah, it's not looking so good. Gaias is trade-bait. No reason to eat resources especially since the new aces kind of need the soul for their own stuff.